World-renowned ophthalmologist and most famous author Mr. Jack J. Kanski (FRCS, FRCOphth; [Figure 1]) passed away on January 5, 2019. His demise is a great loss to the world of ophthalmology. Mr. Kanski was one of the most respected authors and few authors have left behind such a vast legacy. Generations of ophthalmologists have learned and are still learning from Mr. Kanski's authoritative texts on ophthalmology. His numerous ophthalmic textbooks have enabled ophthalmologists around-the-world not only to pass their examinations but have also acted as a resource throughout their ophthalmic careers. 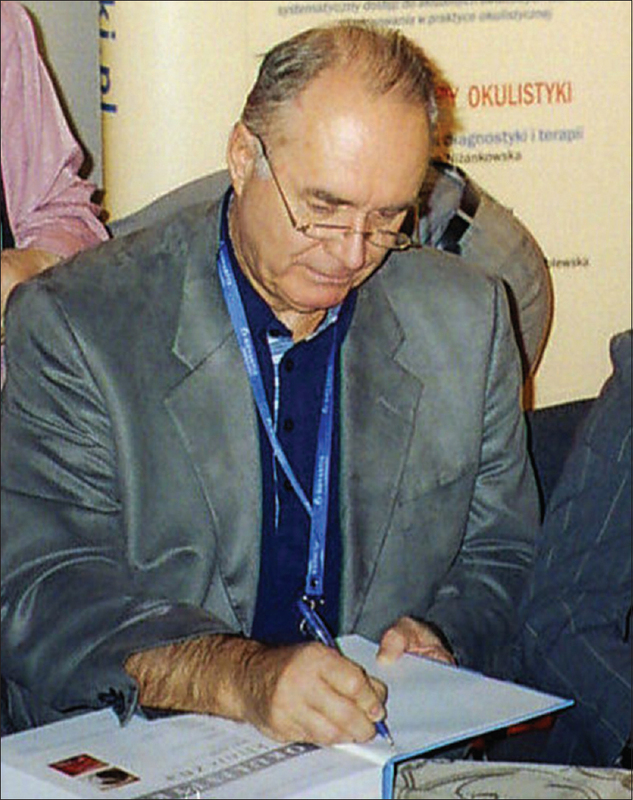 Early Life, Education, and Professional Journey: Jacek Jerzy Kanski (popularly known as Jack J. Kanski) was born on August 5, 1939, in Warsaw, Poland. His parents, Jerzy Jordan and Adela Jozefa (Wroblewska) Kanski, were working in Poland. Mr. Kanski completed medical education (Bachelor of Medicine, Bachelor of Science) from London Hospital Medical School, England, in 1963. He worked as a House Officer in London Hospital from 1963 to 1964; as a Senior House Officer in Western Ophthalmic Hospital, London, during 1965; as a Registrar, Westminster Hospital, London, from 1965 to 1966; as a Resident, Moorfields Eye Hospital, London, from 1966 to 1970; as a Senior Registrar, London Hospital, from 1970 to 1973; as a Consultant Surgeon, King Edward VII Hospital, Windsor, England, from 1974 to 2000. He built the unit into a world-class teaching hospital that attracted ophthalmic trainees from all over the world. His professional journey was indeed remarkable. He was a Fellow of the Royal Society of Medicine, Royal College of Surgeons, and Royal College of Ophthalmologists. Family Life and Hobbies: Mr. Kanski was married to Valerie Ann Shannan on September 3, 1976. The couple had no children. He was a very private person. His interests included reading, swimming, oriental food, and watching films. Contribution to Ophthalmic World: Mr. Jack J. Kanski created the best ever ophthalmic textbooks, illustrations, and clinical Atlas More Detailses.,,,,, His ophthalmic textbooks and atlases are not just books, but real creations of art. The quality of illustrations and clinical photographs as well as the presentation of material are extremely appealing. There are few textbooks of any subject that have made the written material so lucid and illustrative. One of us (SKP) had the opportunity to meet him in the year 2000 and was surprised to learn that he had vast and deep knowledge about world history. In addition to ophthalmic books, Mr. Kanski contributed several books related to world history., His classic ophthalmology book Clinical Ophthalmology: A Systematic Approach is considered a bible of ophthalmology for ophthalmology residents worldwide. Across the globe, ophthalmology training begins and ends with this book and this book has been translated into several languages and continues to be very popular globally. Kanski JJ. Clinical Diagnosis in Ophthalmology. Publisher: Mosby 2006. Bowling B, Kanski JJ. Ophthalmology In Focus. Publisher: Saunders Ltd. 2011. Kanski JJ. Synopsis of Clinical Ophthalmology, Publisher: Elsevier Health Sciences. 2013. Kanski JJ. Clinical Ophthalmology: A Self-assessment Companion, Publisher: Butterworth-Heinemann 2007. Kanski JJ. Illustrated Tutorials in Clinical Ophthalmology, Publisher: Butterworth-Heinemann 2001. Kanski JJ, Bowling B. Kanskis Clinical Ophthalmology: A Systematic Approach 2015. Kanski JJ. Giants of European History: A Concise Outline, Publisher, Matador 2018. Kanski JJ. History of Africa, Asia and Australia: A Concise Outline, Publisher, Matador 2018.